Formed in 1823, Wayne County is the birthplace of the Church of Latter Day Saints, an important stop on the Underground Railroad, and a fertile fruit growing region. Situated on the shore of Lake Ontario, Wayne is the northeastern-most county in the Finger Lakes region. Wayne is the third-largest county by population in the region, after Monroe and Ontario, and the largest in the region by land area. Trends in Wayne County largely mirror the region, with declining median income, a shrinking and aging population, and increasing child poverty; yet, homes are affordable and most crime rates are falling. Although tourism revenue is the lowest in the region and has fallen substantially, the county is home to several interesting spots, including Chimney Bluffs State Park and Hill Cumorah, an historic site where Joseph Smith said he found the golden tablets which were the basis for the Book of Mormon and which hosts an annual Mormon pageant. See below to access the latest Wayne County Report Card, or a summary table of "Hard Facts" impacting this particular part of our region. Stay tuned for a printable pdf summary of how Wayne County is performing on all ACT Rochester indicators, due in June 2019. 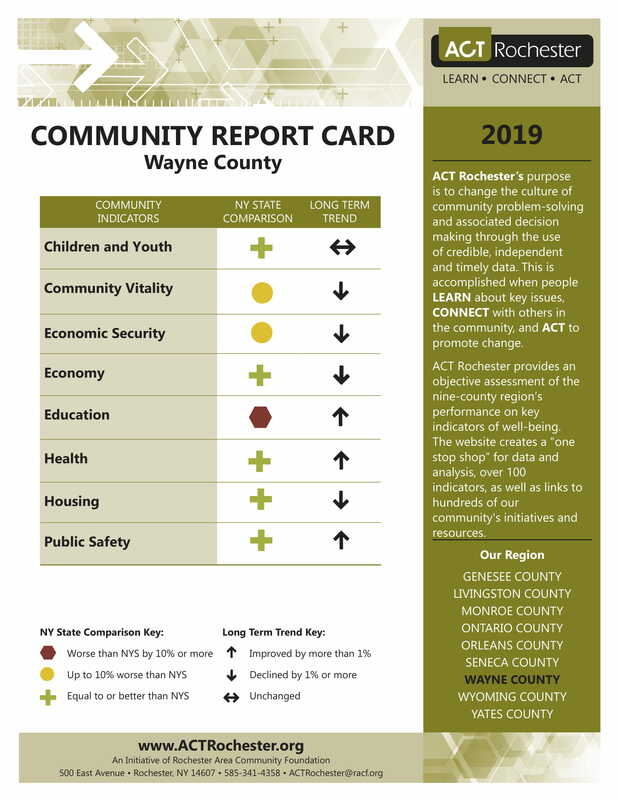 The Wayne County Report Card aggregates data from more than 100 community indicators on the site and use symbols, colors and arrows to provide a quick, at-a-glance overview of the well-being of the county. This data covers each of ACT Rochester's nine topic groups. Click on the picture below for the full report. 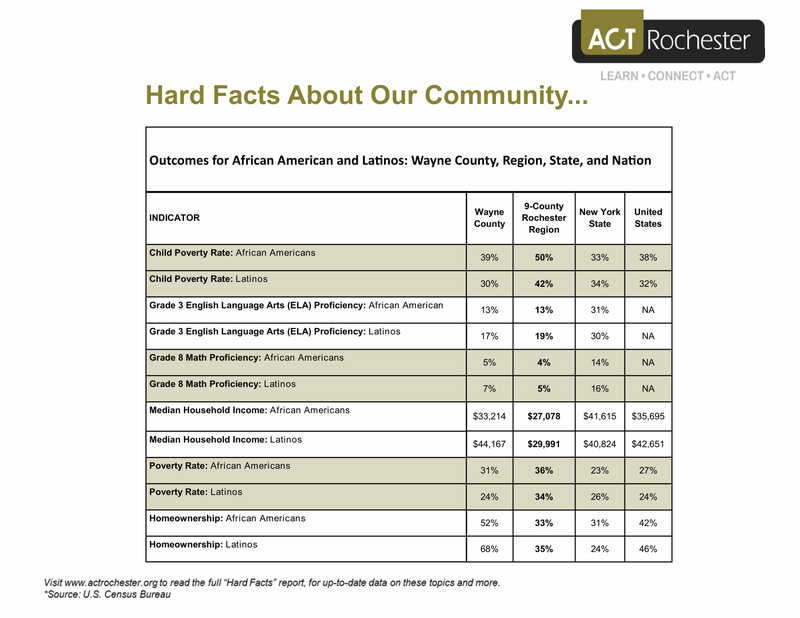 In 2017, ACT Rochester released its latest race report, “Hard Facts: Race and Ethnicity in the Nine-County Greater Rochester Area” to examine the substantial gaps in educational and economic outcomes among persons of different racial and ethnic backgrounds. The table below highlights some of the disparities currently impacting residents in Wayne County.